Panda go Panda is a charming, entertaining pair of 35-minute cartoon film shorts that appeared in Japan at the end of 1972 and the beginning of 1973. To most Americans, this will be a nice gift for the kiddies, and it may even win over adults with its irrepressible good charm and grace. 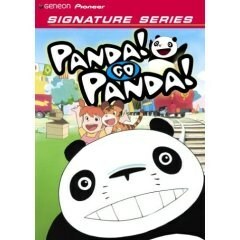 The two Panda cartoons involve a young girl who lives in a country house while her grandmother is away. Two pandas, a small baby panda and a larger, strangely familiar papa panda, wander in and are immediately adopted by the little girl. The rest of the show involves a number of silly comic capers, laced with a gentle charm. This is a benign world, one without villains, really, or anything remotely harmful or scary.